The modern trend of hacking anything and everything never ceases to amaze us. The spectrum is wide; on one side, there is danger in the fact that the more sophisticated automobile computers get, the easier they are to hack. The other end is more fun, like this modification of a shift knob. 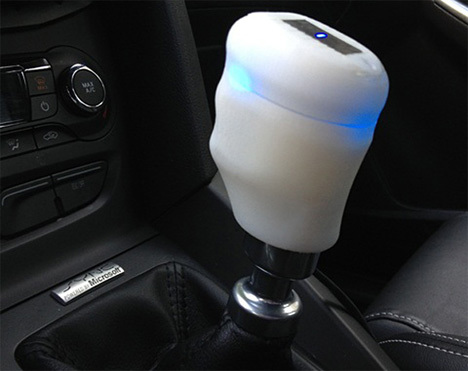 Engineer Zachary Nelson used the Arduino Pro Mini microcontroller and the OpenXC Vehicle Interface to make a vibrating manual shift lever on a Ford Mustang. It monitors the car’s speed, RPM and accelerator pedal position to alert the driver when to shift. It’s an incredibly smart way to teach someone how to drive a manual, particularly if they’re used to driving an automatic. The brilliance lies in the design. Nelson used an Xbox 360 controller motor and a 3D printed shell – form and function rolled into one.